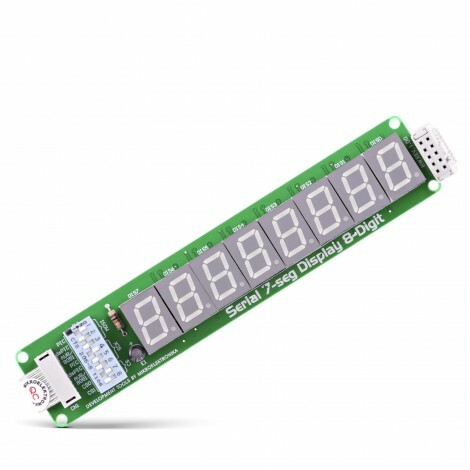 The Serial 7-Seg 8-Digit Board enables you to connect your device to a 7-Segment Display. The board features a Serial Peripheral Interface (SPI), LED display driver MAX7219 and 8 common-cathode LED displays placed in a row. The Serial 7-seg Display Board features a compact, serial input/output common-cathode display drivers MAX7219 used to interface MCUs to 7-segment numeric LED displays via SPI interface. The chip includes a BCD code-B decoder, multiplex scan circuitry, segment and digit drivers and 8x8 static RAM for storing digits. Display drivers are connected to 4 common-cathode LED displays. Board is equipped with a flat cable ending with IDC10 female header connector, which is compatible with all mikroElektronika development boards. It features eight 7-segment digits arranged in a single row.